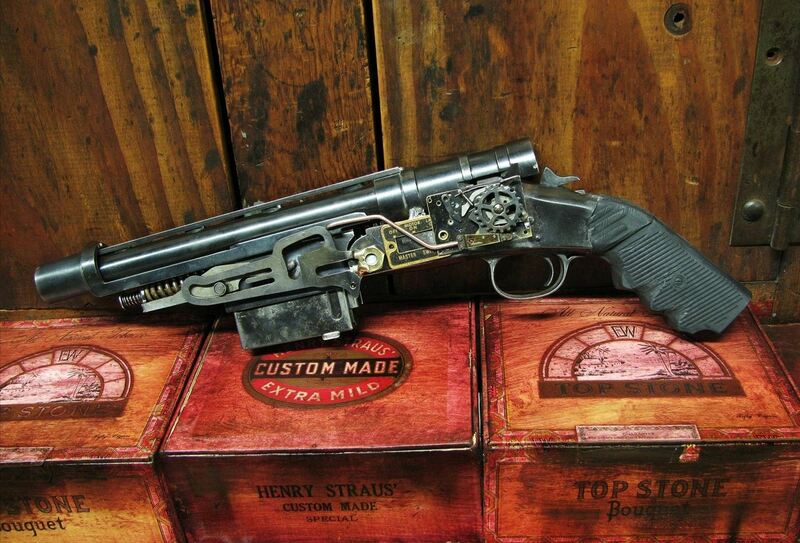 Steampunks and Gun Control: Is Gun Culture Echoed Within Steampunk? Most of us are well aware of the gun control debate currently raging in the United States, a debate which reached new heights in the immediate aftermath of the awful tragedy at Sandy Hook. Personally, I'm on the fence about gun control; I've seen good arguments on either side. For the record, though, I'm not a gun owner. Guns scare the piss out of me. Of course, that said, I own an impressive collection of prop and replica guns, because I think guns, in an abstract way, are really cool. Though, if someone pointed a real gun at me, I would in all likelihood soil myself. It's certainly possible to think something is cool without having to personally indulge in it. For example, many historians study and appreciate past wars, but that doesn't mean they want to go jump into the trenches themselves. It's that very appreciation which fills our popular media with guns, even though the primarily-liberal film industry isn't full of gun owners. Now let's take a look at Steampunk. Within the community, you can see nearly every type of weapon you can imagine, from swords and spears to rifles and bazookas. It's rare to see a character without a gun of some kind, and yet does Steampunk glorify gun violence? It might be easy for an outsider to think so, but I'm going to come down firmly on the side of "no". The majority of the folks I know who include weapons in their costumes don't own any real guns, and prefer to keep it that way. Those I know who do own guns are well-versed in gun safety and etiquette, and don't look at guns as toys. Still, carrying gun props is a perpetuation of "gun culture", and if you buy into the argument that violent media encourages real violence, you may want to take a closer look at the props that your character carries. I don't, but there are many people who do. While you may not consider just carrying a fake gun (as opposed to indulging in war games of some variety) to be violent media, consider that even carrying fake weapons might be seen as implied violence. After all, if you were to openly carry a real gun of that sort, it definitely holds the connotation that you're willing to use it, whether that's true or not. The fact of the matter is that almost the entirety of fandom is based around violence. It's hard to think of a single sci-fi/fantasy show or movie that doesn't feature combat of some variety, and it will take a better person than I to do it. Steampunk is no exception to this rule, as I also can't think of a single example of Steampunk literature or film that doesn't incorporate combat in some form or another. Of course, it's ridiculous to single Steampunk, or even fandom, out for encouraging violence when violence is strewn across nearly every genre of storytelling, even romance and comedy, and it's been that way since time immemorial. Just look at Beowulf or the Iliad for examples of glorifying violence. Still, it's important to consider the ramifications of carrying even a fake weapon. Just by posing with a prop for photographs, you're choosing a side in the violent media debate, even if you never really thought about it that way! Do you think that Steampunks are responsible about their guns? Do you wish less Steampunks would carry guns as props? Leave a comment! Photos from Chauss513, Darkside Costumes, and Akumabito. How To: So, You're a Steampunk… Now What? News: Portable DIY Tesla Coil Gun Shoots 20,000 Volts of Lightning! 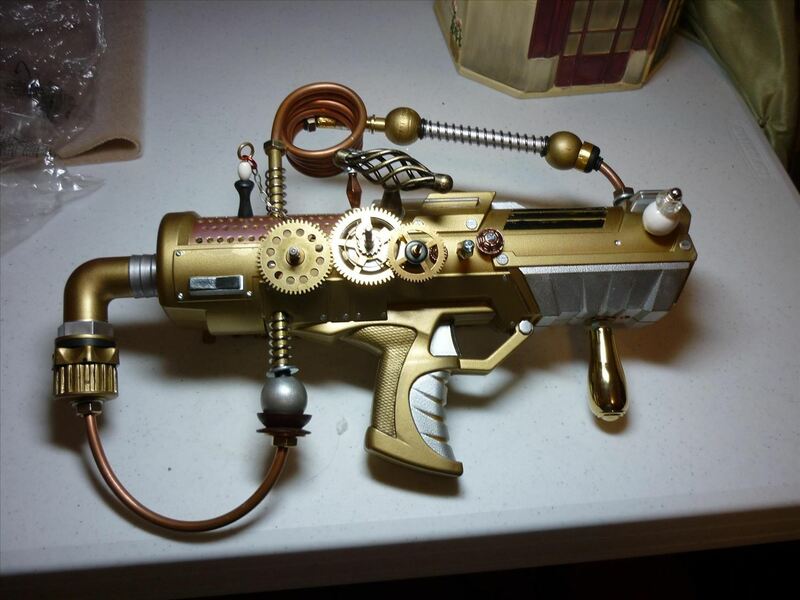 Guns can be seen as another overused trope of steampunk. they really don't make a lot of sense in reference outfits / personas of the majority of people carrying them. In terms of guns and steampunk, I think people will start to run into more and more problems with gun props. Basically, if schools are expelling kids and putting it on their permanent record simply because they have a tiny pice of plastic that resembles a firearm, then I think that having full scale plastic guns would cause even more trouble. I agree, Nathan. People in the community tend to draw a distinction between fantasy weapons and real weapons, but that distinction may not be apparent to those outside of the scene. Steampunk guns are meanly Nerf guns and Tesla coil and i am making a sniper death ray and you can tell that it is fake and Steampunk so gun control for steampunk is stupid and steampunk is not only guns and Tesla coils. While I think it's important that each piece of a person's costume to mean something to both the person and their persona, it is notable that prop firearms are indeed part of the Steampunk Genre, and it makes perfect sense. 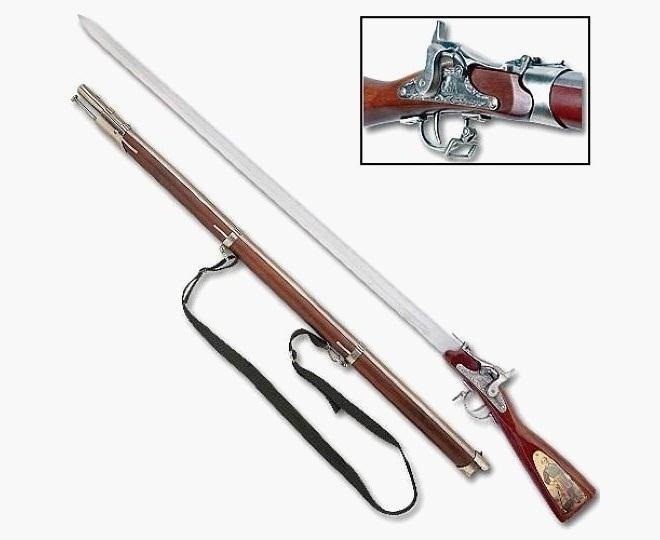 While many people do not realize it, firearms (and weapons in general) have been a part of historical culture since they were developed in the middle ages; before that, the sword was the dominant weapon on the battlefield. It was considered a mark of prestige to carry a firearm in Europe because until the 1600s they were very expensive. The sword was only retired from the field of war in 1945, after Japan surrendered. Prior to that, it was a mark of service, rank, or accomplishment in many countries, and often still is. The very idea of firearms not being as common as carrying a pen or a knife is a very modern convention; in fact, it was a non-issue until the 1960s. We as Steampunks are anachronists; we live in days gone by. We need to accept that firearms were not even considered a separate "culture" back then, like it is now; it was simply a part of life. Leave the replica weapons in Steampunk. Taking them out accomplishes nothing other than limiting the number of people that would be interested in being one. You could be in a room full of gun owners and never be able to tell, because they're just normal people. I find the vast majority of people who are anti gun have had absolutely zero real life exposure to them, and thusly are using something they do not understand (but are convinced they know everything about) as a way to blame a group of people that are of a different mindset for whenever someone does something bad. It then gives the anti gun person the reward of feeling like the hero who could have prevented the crime if only the rest of society had listened. Anyone who frets over an adult carrying a clearly fake gun because they imagine it may have a negative effect on society really needs to get outside and open their eyes to how many real problems the world has rather than doing nothing besides pointing fingers.